This peak is unnamed on the Discovery map. There is a cairn near the summit, which could be the leacht in question. Previously Greenane East in MV. 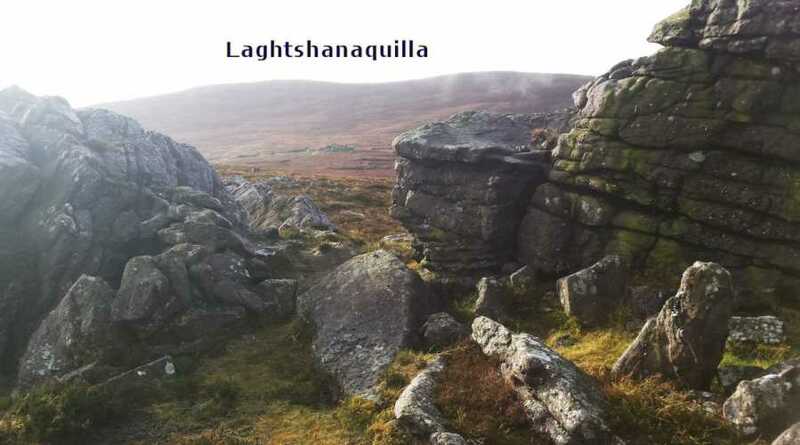 Laghtshanaquilla is the 239th highest place in Ireland. An American guest was reclining on our couch some years ago when I rushed in to catch the Nine O'Clock News on the TV. She sat up and stared for a few moments. I thought she was reacting to a threatened change in wholesale interest rates, but I was wrong. "She wouldn't be allowed on our TV" she said disapprovingly. "Hard to listen to " I said pandering to what I thought was some kind of reaction to the perceived lefty politics of the presenter, "RTE is dominated by the Unions"
"No" she said "People who LOOK like that don't get on American TV"
She meant that the presenter was neither a Ken nor a Barbie. The presenter was a totally normal Irish person, the sort you'd meet at the supermarket checkout. I was mildly amused to think that Americans should require their TV folk to be physically perfect notwithstanding the imperfection of the population at large, so to speak. "How did this lump Laghtshanaquilla ever get into one of our lists?" It seemed to be merely a wobble of bog. Now that brief unworthy thought was born of a wild December day, hours before the solstice, when the northern earth enters its dark night of the soul. I will admit that I harboured this condescending notion for some minutes, and in that spirit of negativity I crept behind the rocky outcrop at Point 597 and photographed Laghtshanaquilla through the conglomerate stacks, making sure that the stone dominated the scene.